This layered Berry Trifle is a simple trifle recipe with layered berries, cake and a sweetened whipped cream. Watch the video showing you how to make this recipe, then scroll to the bottom of this post to print out the complete recipe so you can make it at home! 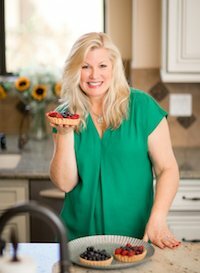 This is a great dessert to make when you have access to delicious, juicy fresh berries! Berries can be pricey at certain times of the year. 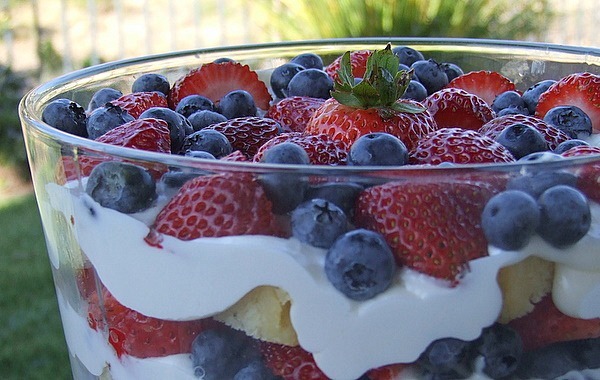 When you spot berries on sale, grab that deal and plan to make a layered Berry Trifle! 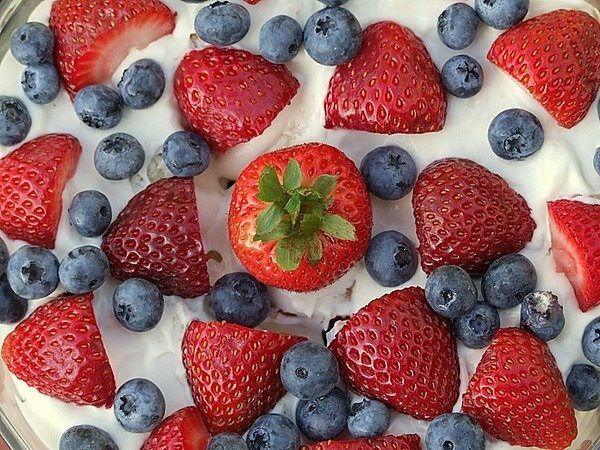 It’s such a pretty dessert for Easter, Mother’s Day, 4th of July or spring and summer barbecues! 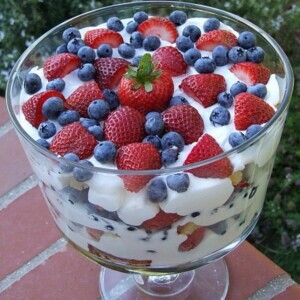 It is super pretty sitting on display, and everyone loves a dessert using fresh berries. The best part is that it’s really easy to make ahead and keep in the refrigerator until ready for serving. 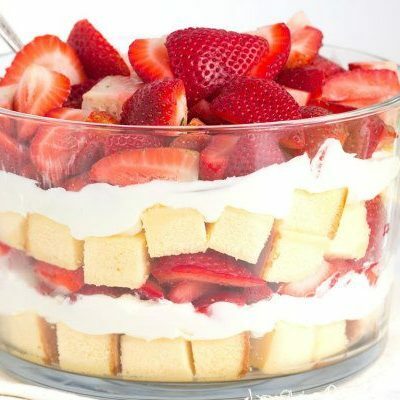 A trifle is a dessert that has layers of fruit, creamy fillings and pieces of cake or cookies. 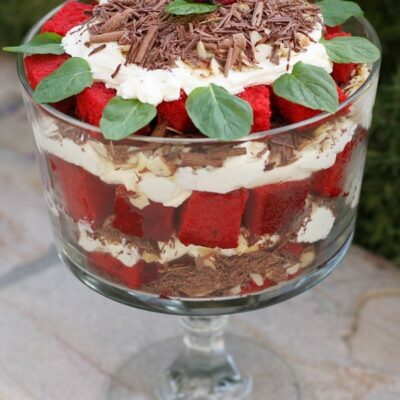 It’s said that the trifle dessert originated in England in the eighteenth century. 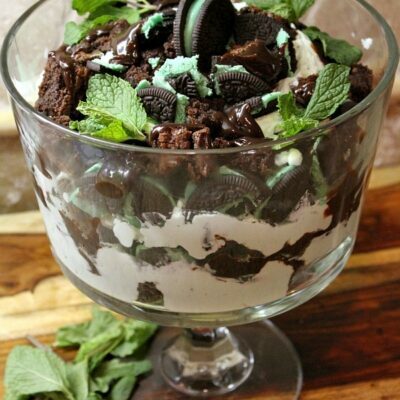 It was a very different dessert back then with funky additions of gelatin. These days, a proper English trifle is made with real egg custard poured over sponge cake soaked in fruit and sherry and topped with whipped cream. 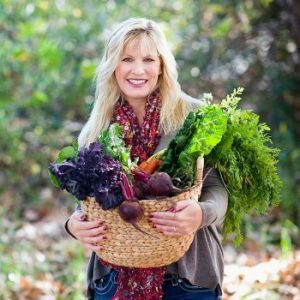 We’re making a much simpler version on RecipeGirl! This Layered Berry Trifle is an easy-to-throw-together dessert. It’s one of those, “Oh my gosh… I need an easy, impressive dessert and I don’t have time to bake” desserts. There is no cooking involved except a quick sugar/lemon juice/water boil to make a syrup. Just buy your Berry Trifle ingredients and the store, and put it all together. My Berry Trifle recipe layers store-bought pound cake (or homemade pound cake if you’re so inclined) that has been brushed with lemon-syrup, a sugared cream cheese-whipped cream, and any berries that you’re in love with at the moment. Blueberries and strawberries work perfectly. Add raspberries to create a triple berry trifle! What is a trifle bowl? A trifle bowl is glass and usually has straight sides and a straight bottom so that the layers are displayed. You don’t have to own a trifle bowl (though it’s very pretty if you do! ), but if you can find some sort of pretty, tall glass bowl- that works too. I bought a very basic trifle bowl on Amazon, and it’s perfect for this recipe. It’s fresh. It’s simple. It’s so good. Make it a little less evil by using lowfat cream cheese and fat-free pound cake, if you’d like. Don’t worry at all about using store bought pound cake because NO ONE WILL KNOW! I don’t care for the frozen pound cake, so I usually look in my grocery store’s bakery to see if they sell sliced pound cake (they usually do). 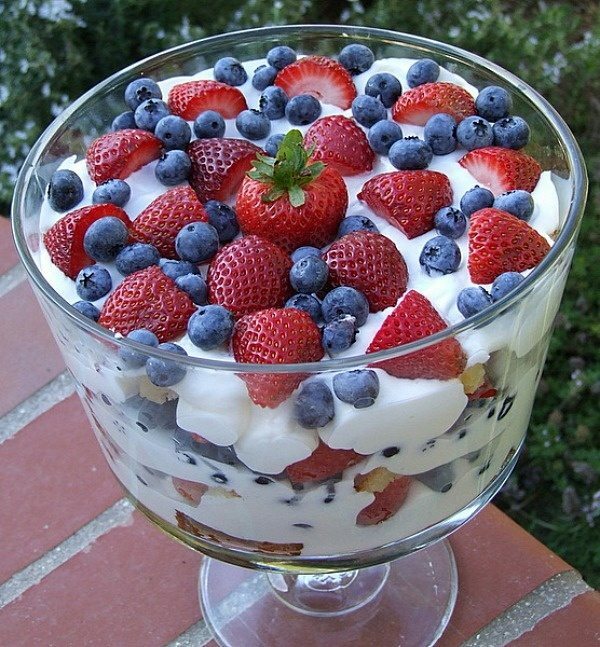 To serve, just use a large spoon and dip it into the side of the trifle bowl to scoop up berries, cake and whipped cream from the bottom. Spoon it into a dish and pass out to your guests! This Berry Trifle layers fresh berries, sweetened whipped cream and pound cake. In a small saucepan, bring the sugar, lemon juice and water to a boil over medium heat. Stir to dissolve sugar completely. Let cool. Slice the cake into 3/4-inch slices. Then brush syrup over both sides of each cake slice. Quarter each slice. Beat the cream cheese with sugar on high speed until light and fluffy. Reduce the speed to medium and slowly add the cream. 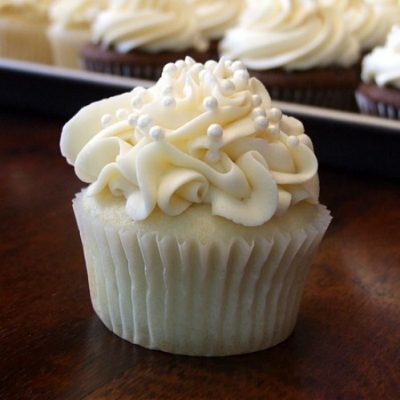 Continue beating until the mixture resembles soft whipped cream. 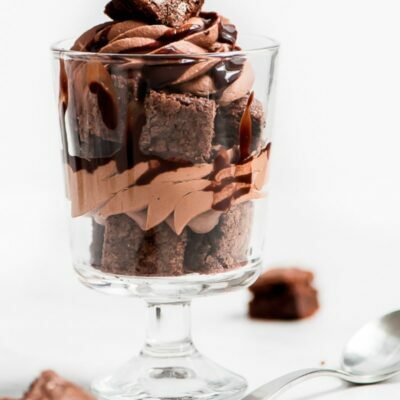 Arrange half of the cake pieces in the bottom of a glass serving bowl or dish (2-quart size is sufficient). Spoon half the cream-cheese mixture over the cake in dollops; spread to the sides of the dish. Scatter half of the blueberries and strawberries on top. Repeat layering with cake, cream cheese and berries. Pile additional strawberries on top. Cover and refrigerate until chilled (about an hour). You may also refrigerate overnight. For a lower fat version, try using fat-free pound cake and reduced-fat cream cheese. Try substituting raspberries for strawberries, or use all strawberries, or get creative with your berries! I presume that you spread the syrup on the cake slices??? Yes, you brush the syrup on the slices. I made this amazing dessert for a Memorial Day BBQ and there was not a drop left!!! So easy and everyone loved it. I made it again today for another BBQ but realized I was out of whipping cream so I substituted for half and half and it was great. Thank you for the great recipe! I made this for Memorial Day because of the colors. As I was making it, I was not so sure, but I have to tell everyone….it was the best dessert on the table. Everyone was raving about it. This is definitely a keeper. I can’t wait to make it again with a variety of berries and double the cream. The pound cake with the lemon was amazing! Thanks for sharing! 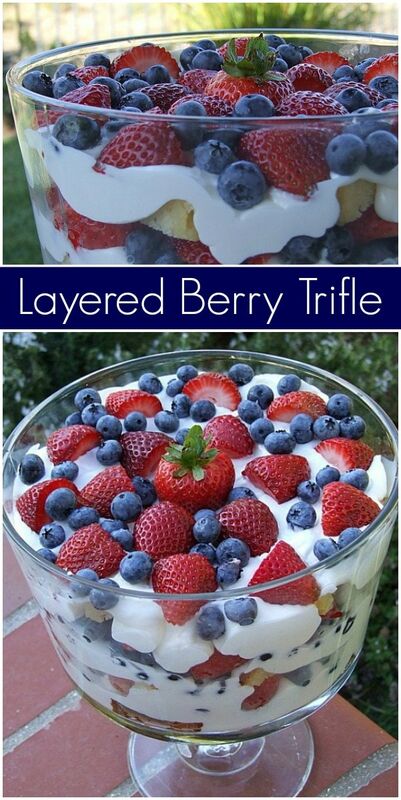 I’ve made this triffle multiple times. It’s always a hit, however I thought the cream was a tad bit too salty. A read a review where the reviewer mentioned she used strawberry cream cheese. I tried that and thought it was to sweet. The last time i made it with one container of regular and one container of strawberry cream cheese (since I always double the cream anyway) and it was PERFECT! It’s always the first desert to go at get togethers but this time I got more compliment then ever! Also make sure you beat the cream on high for a while before adding the heavy cream, then continue beating until its really nice and thick. The first few times i was scared of over beating like regular whipped cream so it didnt really get as thick as i would like but it wont happend with the cream cheese so beat away. If you beat it enough, it gets really nice and airy but still thick and flavorful. PERFECT! 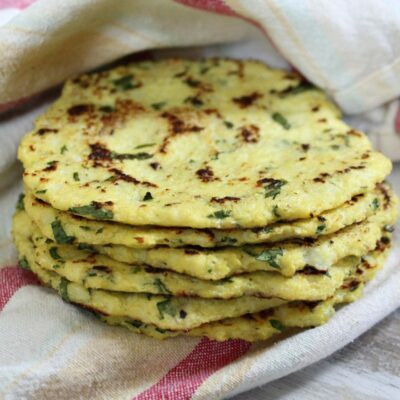 Made it yesterday and it was a hit – great recipe! I doubled the cream as well. I love this and have made it a few times, unfortunately I find that there isn’t enough of the cream so I have to double it every time. Good tip- I often like more of it too! My Grandaughter made this Trifle and it was melt in your mouth delicious and beautiful. Oooh now this does look GOOD!